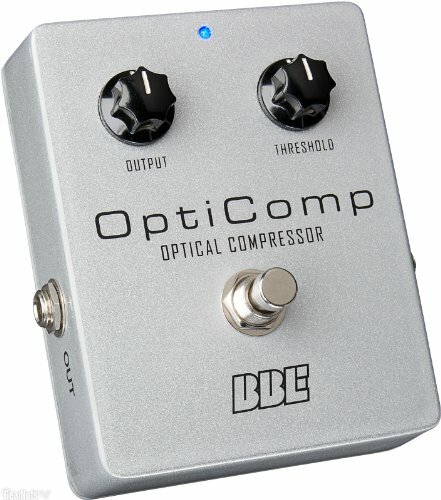 Bassists and guitarists alike can benefit from a quality optical compressor pedal, but basses have a special challenge: massive signal-level spikes compared to guitars. That is why many bassists want to tightly control signal level. Whether you are just looking to dial in a smoother sound or keep the front end of your amp from clipping, an optical compressor is just the thing. There is none finer than what you will find in the studio-grade, solid-state OptiComp compressor pedal. In fact, it is the same circuit found in the award-winning BBE BMAX and BMAX-T bass preamps. True to form, OptiComp features a beefy mil-spec circuit board with big, fat signal traces, 1 per cent metal-film resistors and high-voltage poly caps, all backed up by a robust true-hardwire bypass. Studio-Grade optical compression with Output and Threshhold controls. 1MEG Ohms input impedance for proper pickup loading and 1K Ohms output impedance when engaged. 1 per cent metal-film resistors for consistency, High-voltage poly caps for better tone and Military-spec circuit board for reliability. Blue status LED for high visibility and low power consumption and Easy access battery compartment. If you have any questions about this product by BBE Sound, contact us by completing and submitting the form below. If you are looking for a specif part number, please include it with your message.